I’ll let you in on a little secret: the Bike EXIF team doesn’t always agree on what’s hot and what’s not. 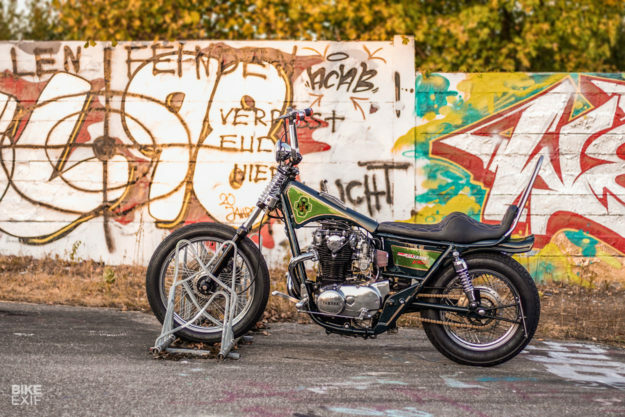 But no motorcycle has polarized opinion as much as this whacky Yamaha XS650. In the end, fun and goofiness prevailed. 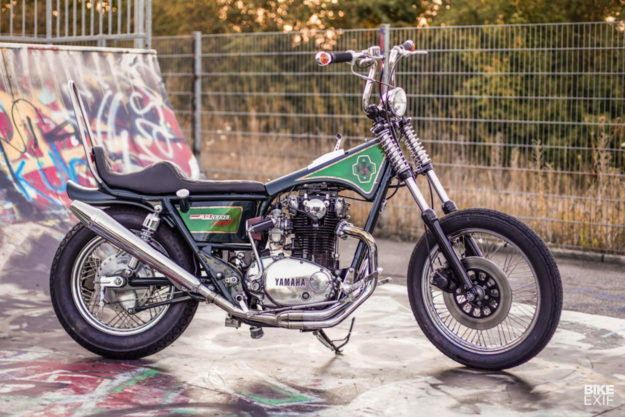 And so we present Bonanza Krad, a bicycle-inspired Yamaha, from the hands and minds at Germany’s Benders Company. Based in Wiesloch, Benders is a five-man team founded by Christian and Raphael Bender. The brothers grew up fiddling with bikes, selling them to finance new projects or to travel. 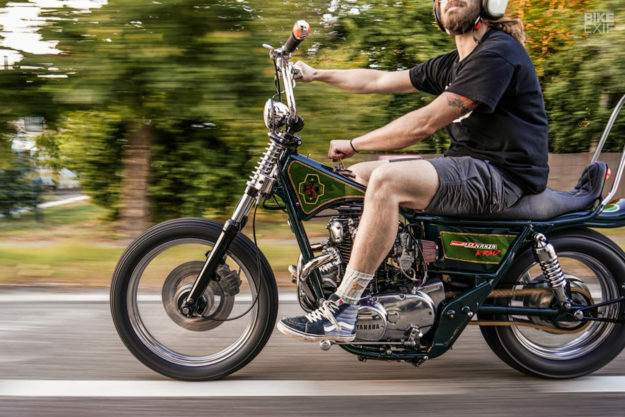 For this build, they went right back to their youth—drawing inspiration from the Kynast Bonanza bicycles of the 60s and 70s—a kid’s chopper bike popular in Germany, similar to the American Schwinn Sting-Ray and the British-made Raleigh Chopper. 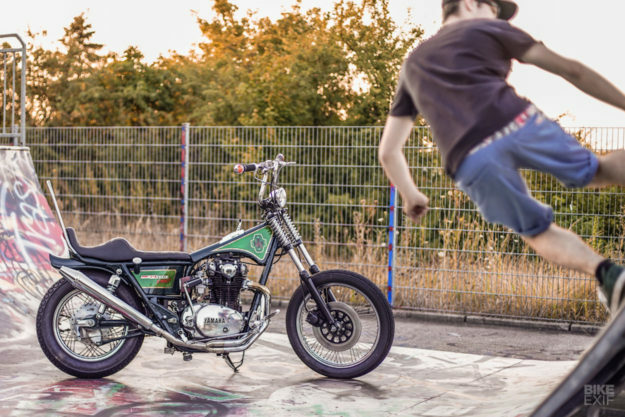 Even though the idea was totally left field, Benders still wanted the 1981-model Yamaha to be as much fun to ride as possible. So they tore into the motor first, boring it out to 750 cc. The rebuild included new pistons, revised compression, a new ignition, and a switch to a 270 degree firing order. They also installed better carbs, and fitted a pair of K&N filters. Under the hood, they rewired the whole bike around a Motogadget m.unit controller. And they ripped out the starter—so this XS is now kick-only. 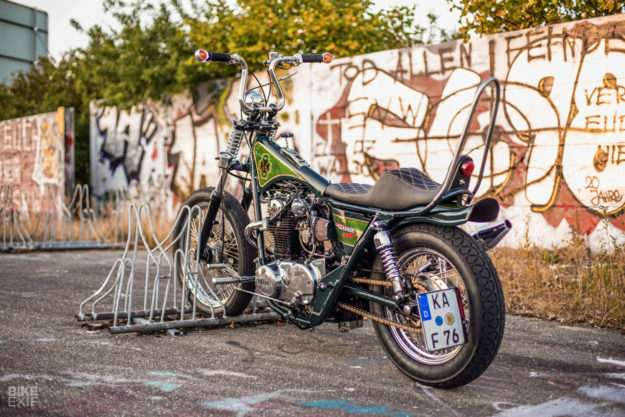 Moving to the chassis, Benders shortened and looped the subframe—then kept going with a sissy bar of comedic proportions. The king & queen saddle is (obviously) a one-off, and together with the rest of the rear end, nails the retro banana-bike look effortlessly. The back’s finished off with a set of slammed shocks, and a tail light that’s mounted into the back of the passenger seat. 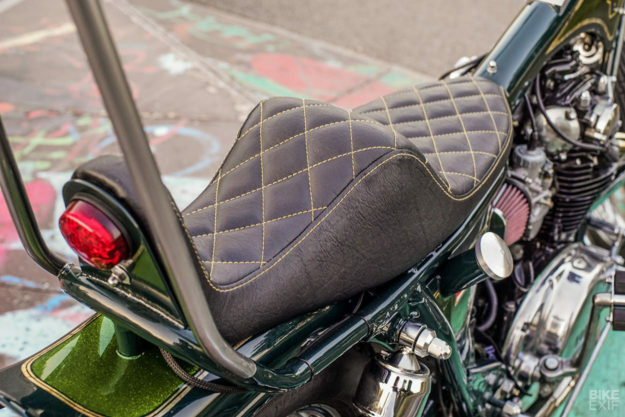 Plus there’s a modified aftermarket fender, originally intended for a Harley. The Bonanza aesthetic is equally well represented up front. Benders sourced appropriate handlebars, headlight and grips from local vendors, then finished them off with bar-end turn signals, mini switches and modified levers. As for those springs on the forks—they don’t do anything, except mimic the ‘fake’ springs on the original Bonanza. The XS650 still rolls on its stock wheels and brakes too, but they look as good as new now. Then there’s the centerpiece of the build: that hand-made fuel tank. Benders shaped it from steel, designing it to mount over the frame’s backbone and sit ‘in’ the frame, rather than on top. It feeds the carbs via a small aftermarket fuel pump. 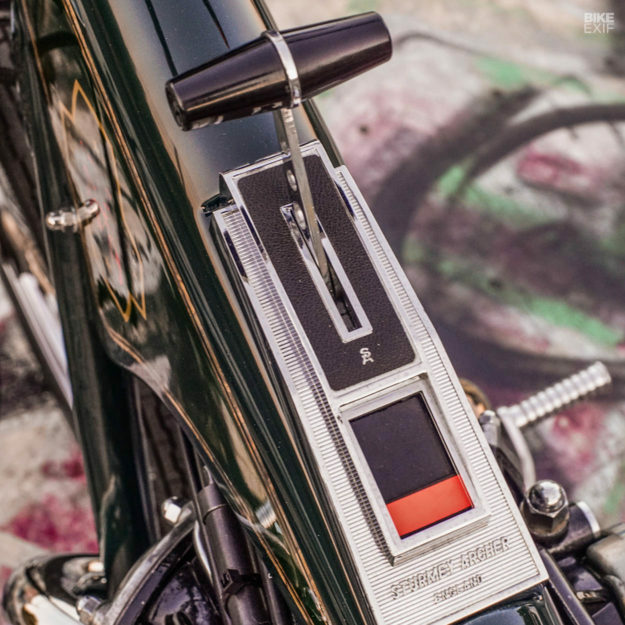 That lever on top is an original Sturmey Archer stick shift—similar to what you’d find on an old Bonanza. This one was sourced from eBay and modded to fit. It does nothing more than look the part and switch the headlight on and off. 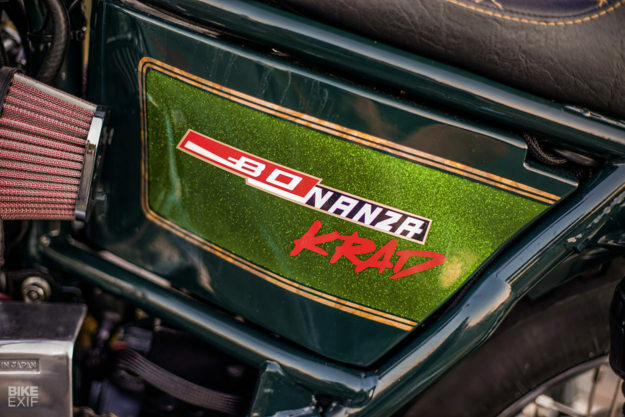 The rest of ‘Bonanza Krad’ is adorned with thoughtful little details. 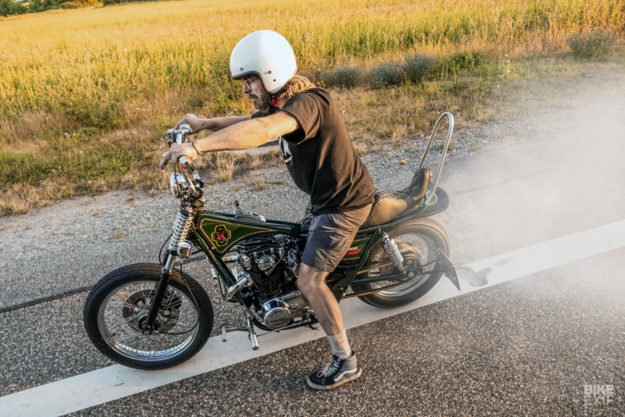 These include a two-into-one exhaust system with an extended muffler, a set of forward foot controls, and bicycle pedal on the kick-start lever. And despite the Yammie’s silly looks, it’s been finished to a remarkably high standard. The engine’s been cleaned up and refinished, and the frame powder coated. But it’s the paint that seals the deal. Benders brainstormed ideas with the client, then turned to Michael Schönen of Lackmuss to execute it. It’s a killer livery, with retro logos sending it over the top. For many motorcyclists today, a banana-bike is where their two-wheeled obsession started. 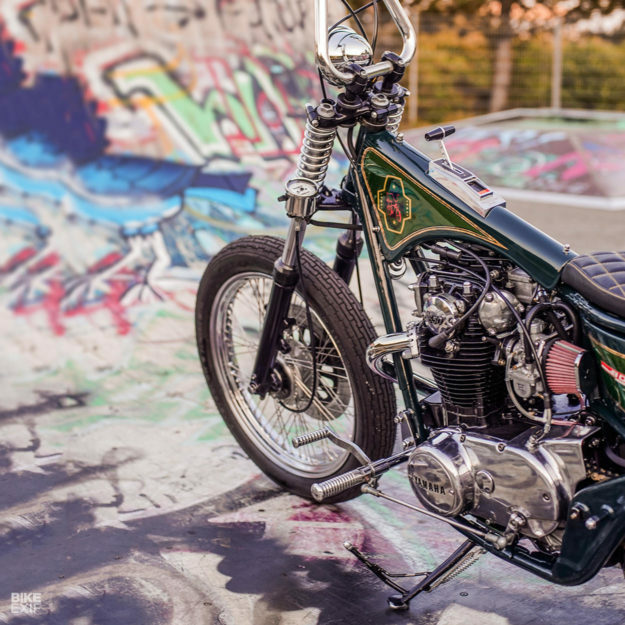 And this XS650 is the perfect double hit of irreverence and nostalgia. So which side of the fence are you on? Is this an abomination, or are you itching for a ride?